This entry was posted in Uncategorized and tagged Hexagons, WIP. Bookmark the permalink. 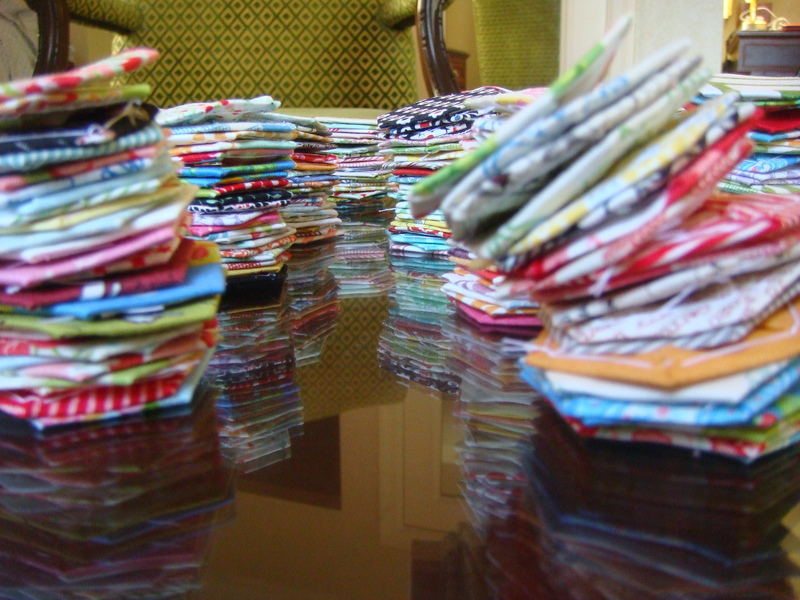 Will it be a charm quilt, or are you making more than one hexie out of each fabric? 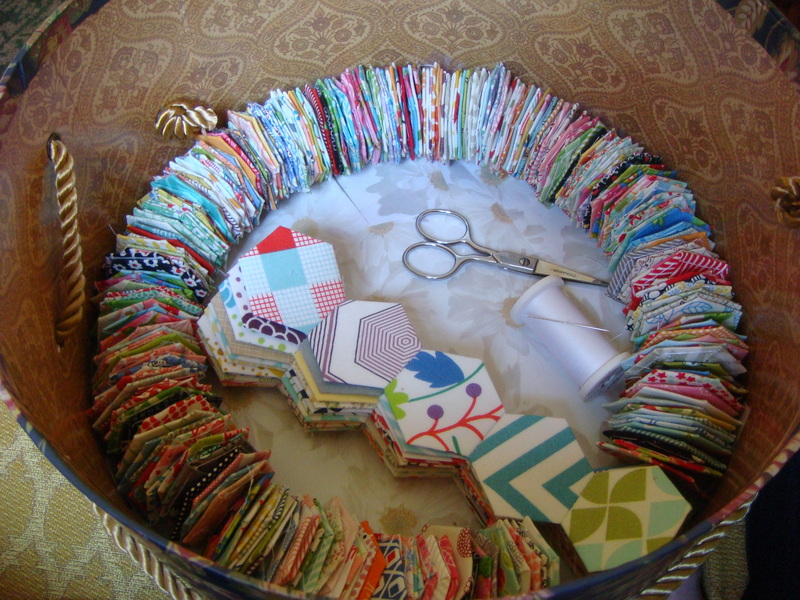 Your hexie quilt is coming along nicely! I do love those low volume prints. Love the pic with the shiny table! 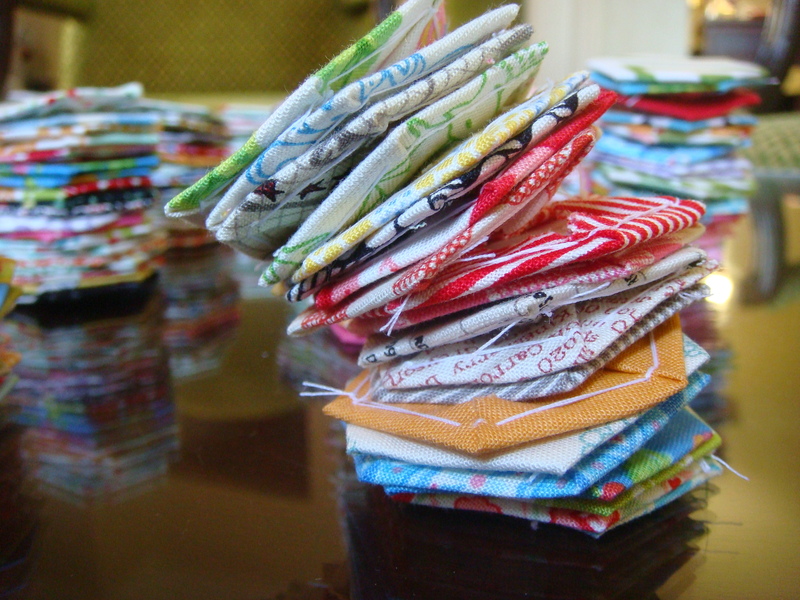 Looking forward to the new year when you can show off your finished quilt! The longer it takes, the more love it will have in it. These things can’t be rushed! Plus, you’re right. Having those hexies around is adorable. Great pictures, Sarah! I am uber impressed…with the pics and hexagons! I LOVE this! seriously, this is adorable. this is going to be gorgeous! slow and steady, right? I always think of my knitting as “bonus” projects too! Keep being brave. That math is not so scary. 1/3 of the way through basting is great. And those hexies are so tiny. I know that quilt would take me five years to make. It will be one to enter in a quilt show or a county fair when you finish, for sure. Good luck – we can share experiences and photos. Beautiful ……love the fabric and the quilt will be amazing. Sarah, I’ve been working on my 6 pointed star quilt (English paper piecing also) for about 5 years and I’m halfway done. Like you said, when it’s done it’s done… no deadline. I work on it as I travel and when I go to quilt guild, etc. Love to work on it in the car, waiting for my husband to run his errands. Sure is addictive! That’s going to make a gorgeous quilt. So pretty! You’re way braver than me to even attempt something like this! Way more progress over here than on mine, this is going to be gorgeous! I love that shot of them all in the basket! 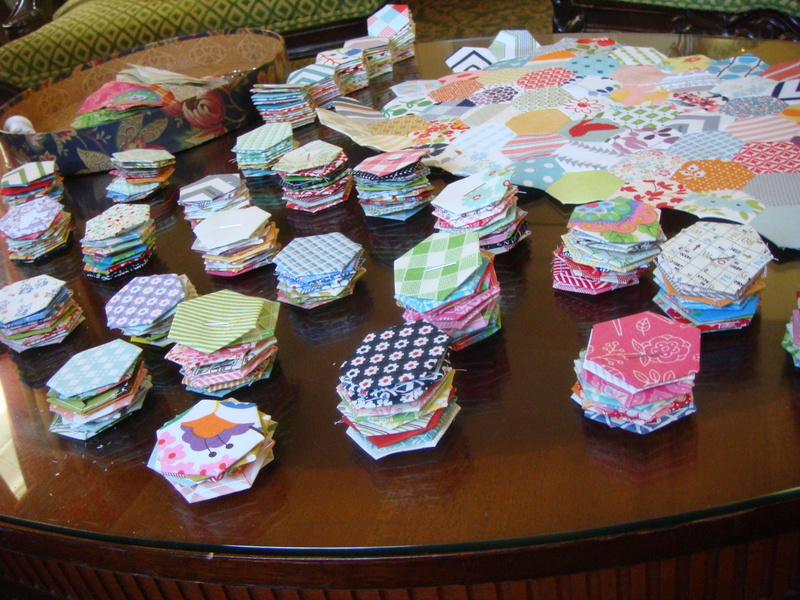 Wow what an undertaking with all the hexies! You’re making good progress and thinking of it as a bonus project with no pressure to complete immediately is exactly how to go about it. 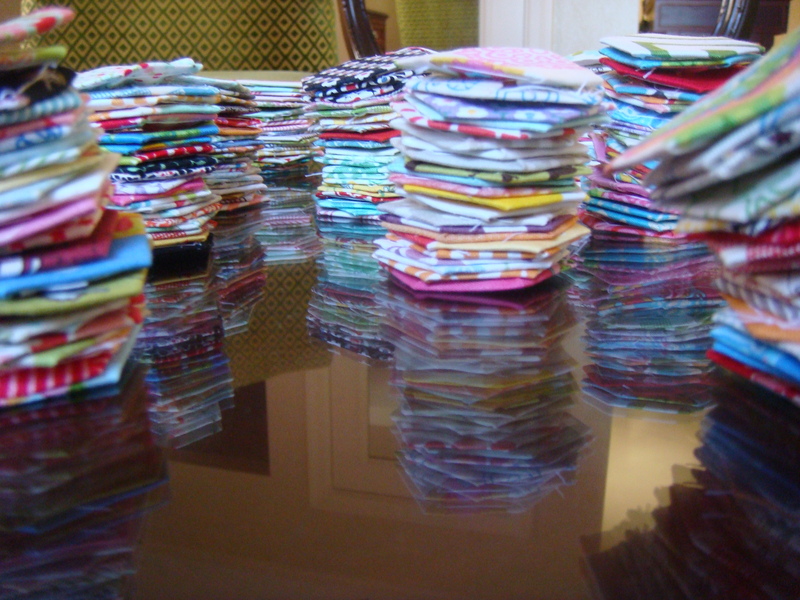 I’ve been working on my 1″ hexie quilt since January and have around 600 sewn together so far with a bunch more basted. It’s slow going, but the end result will be an irreplaceable heirloom. To make mine extra meaningful, I purchased fabric markers in a few colors and have been having family sign fabric before it gets basted. At a glance, it just looks like another text print so they blend right in. I figure I’ll have fun finding them once the quilt is finished. Loving all the hexies. It’s going to be incredible!! I love projects that almost give you permission to take your time on. thanks for linking up to the “in hand” party and introducing your project. hope you have some progress to share next month! It’s looking great Sarah. Love the photo of your ring of hexies! Beautiful hexies and I like your attitude! I’m working on an EPP quilt too (rose star blocks) and refuse to do the math because it would put me off! Also I’m just really bad at math! I have finished mine 1′ hexies oh my god what was I thinking . Now how to finish it. that’s the challenge. I don’t want to loose the shape . buy putting a border on it. any Ideas ? Help plz..